Buy Clearspring green nori sprinkle 20g in the UK from our online shop or directly from our independent Scottish store. Green nori sprinkle can be sprinkled on pasta, soups, rice and used in bread. 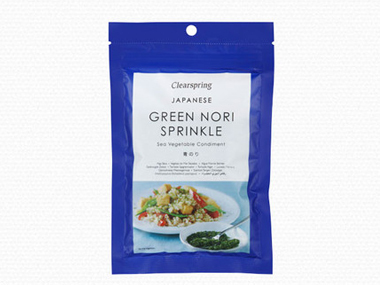 Clearspring green nori sprinkle is a different variety of sea vegetable to sheet nori, containing significantly higher levels of minerals, making it a nourishing as well as tasty condiment to keep handy for serving with all kinds of food. Never knew what to do with seaweed? Try this healthy alternative to meat burgers, made with tofu and seaweed! Seasonal recipe with tomatoes and lettuce. This recipe contains 10g green nori sprinkle. Nori is a sea vegetable high in iodine. You can use it not only for making sushi, but also in this summery gluten free pasta dish. This recipe contains 2 tbsp nori sprinkles. A colourful dish with seasonal vegetables. Quinoa is high in protein, but you could add a vegetarian sausage if you like (read the label if you have any allergies). This recipe contains 1 tbsp nori sprinkles. Fun to make with children. Enjoyable to eat! This recipe contains 1 tbsp nori sprinkles. Where can you buy real Green Nori Sprinkle safely online? If you are wondering where you can buy Clearspring green nori sprinkle 20g safely online in the UK, then shop with us. Green Nori Sprinkle - Clearspring green nori sprinkle 20g in Seaweeds and Foods.